This is one of the finest cuts on the animal and its taste should be allowed to shine. Goat is more gently flavored than lamb so we use fresh marjoram rather than the stronger rosemary you would find in traditional lamb preparations ofSouthern Europe. As goat is so lean (just 2.6 grams fat per 3-oz. compared to 16 grams in lamb) it benefits from an overnight marinade which infuses the goat with moisture and fat to prevent the meat from drying during cooking. Marinate for 24 hours. A goat rack also cooks faster than lamb so keep the heat moderate (325 degrees) for gentle roasting and remove it just as it hits medium rare at 145 degrees (about 20-24 minutes). Combine any remaining fresh marjoram with oil and a touch of sherry vinegar to accent roasted vegetables such as beets, onions, small red potatoes, artichoke hearts, asparagus or peppers to accompany your rack. To be able to concentrate on cooking the rack, I roast the vegetables before the meat goes into the oven and then set them back in to warm as the rack rests. Combine all marinade ingredients in a zip-lock bag, add the rack and roll to cover well, press out the air and seal. Refrigerate overnight. At time of cooking, remove the rack and pat dry. Discard marinade. Let rack sit at room temperature for 30 minutes before searing. Preheat the oven to 325. Heat an ovenproof sauté pan over high heat. Salt and pepper rack well and brush with olive oil. Place in hot pan and sear for 2 minutes on all sides to brown. Move the pan into the oven and roast for 10-12 minutes. Turn rack over and roast for an additional 10 minutes (check with a thermometer for 145 degrees). 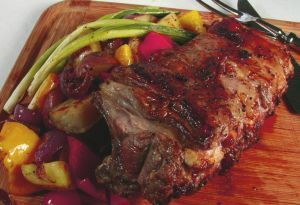 Remove from oven, allow to rest covered for 8 minutes (to finish cooking and consolidate juices) before slicing into chops. Cook’s Note: You want the rack between medium rare and medium for best flavor and tenderness. If you find your rack in underdone, cook the sliced chops under a broiler for 1 ½ minutes on one side only. Flip over and serve the pinker side up.